The anthology of Electronica Imaginary Friends (73'59") has a personality. As the disc progresses across its 11 tracks the energy level gently rises. Each passing work becomes more active, building on the previous piece. Field Rotation opens this collection with reverberant piano and cello played tenderly beneath a lush digital ambiance. Kevin Andrew's contribution is airy, but never air-headed. With an emphasis on consonance this artist foregoes simple melodies and basic rhythms for a deeper exploration of sound and mood. The work by Rena Jones becomes swept away in moody atmospherics. Coiling surges nest inside long unwinding passages as this gritty yet gorgeous composition skips and hops in time with echoing cello lines and electro-percussion. 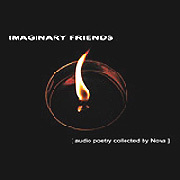 Also on this album are works by Ultimae label regulars Asura, Solar Fields, AES Dana and their notable contemporaries. Hearing this much variety of music surely will lead the listener to feel part of a bigger continuum. Because so much about this music is a mystery, taking the time to quietly study it can be a beguiling experience. These beautiful and complicated works have been realized through a sophisticated comprehension of the Ambient genre. With its musical layers changing as they are perceived, Imaginary Friends lingers on like a remembered dream.